Shakti is a Hindu concept which regards the feminine aspect of divinity supreme and considers all other forms its manifestations. 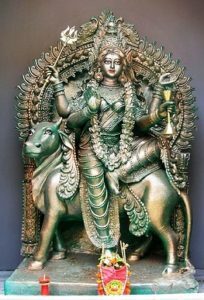 In Shaivism it is feminine aspect of Shiva, which is manifested as Parvati and the concept of Ardhanareeswara which treats it in equal footing. The ‘Tridevi’ concept worships the feminine side of Trimurtis, Brahma, Vishnu and Shiva as Saraswati, Lakshmi and Parvati. 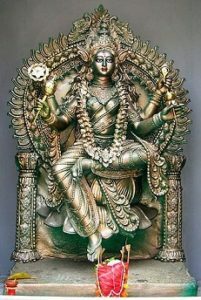 Shaktism considers theses three feminine manifestations deriving from Supreme divinity Mahashakti or Adiparashakti. 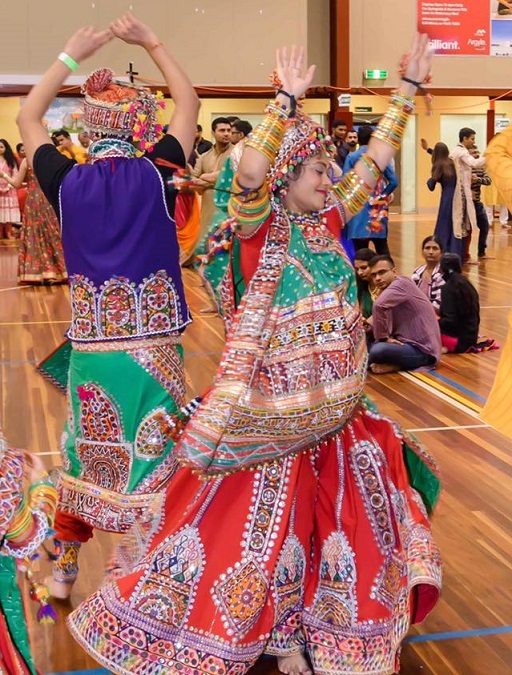 During Navratri, first three nights are devoted to Kali or Parvati, Lakshmi on the fourth to sixth nights and Saraswati on the seventh, eighth and the ninth night. Among the manifestations of Shakti, Hindu texts attach high significance to Shakti associated with Shiva. Shakti is the eternal consort of Shiva and the embodiment of power. 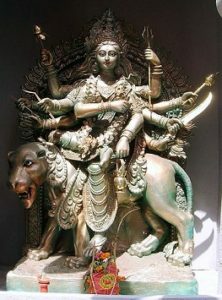 Durga the warrior Goddess, is wife of Shiva and another manifestation of Parvati. Durga is depicted in Puranas as a goddess riding a tiger or lion combating the evil forces. 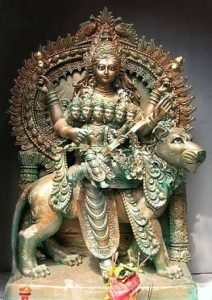 Sharada Navratri, which falls in the Hindu month of Ashwin (September or October in English Calendar), dedicated to Durga Maa and her nine avatars. Sharada means autumn; which distinctively differentiate it from four other Navratri’s Hindus celebrate. The other three Navratris celebrated are Vasanta Navaratri; in spring, Magha Navaratri: during winter and Ashada Navaratri: at the start of the monsoon season. 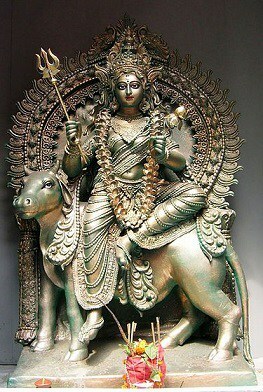 Day 1: SHAILPUTRI: Shilaputri is the first among the navdurgas. 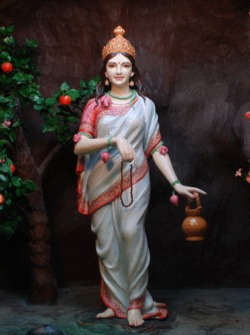 The first day of Navratri, Shilaputri is worshipped. Shilaputri means the daughter of the mountain. She is the daughter of Himalaya and is also known by names like Sati, Bhavani, Parvati or Hemavati. Day 2: BRAHMCHARINI: Brahmacharini form of Durga is maiden Parvati, who had a strong resolve to marry Shiva. She begins to live in mountains like Shiva, engage in the same activities as Shiva, one of asceticism, yogin and tapas. Day 3: CHANDRAGHANTA: Chandra-Ghanta, means “one who has a half-moon shaped like a bell”.Her blessings eradicates the sins, distresses, physical sufferings, mental tribulations and ghostly hurdles of the devotees. Shiva, goes with procession to Himavan’s palace to seek the hand of Parvati. But Shiva was in his most terrorising form, and Parvati’s mother faints seeing him. Parvati transforms herself into Goddess Chandraghanta to save her mother. Day 4: KUSHMUNDA: Ku means “a little”, Ushma means “warmth” or “energy” and Anda means “cosmic egg”. She is believed to have created the universe with her smile. Day 5: SKANDAMATA: Skanda is Lord Subrahmanya or Kartikeya, and mata means mother. This is Parvati in the form of a mother. Day 7: KALRATRI: She is the fiercest form of Durga and dark in complexion with a dishevelled hair. She has three eyes and flames emanate from her breath. She is dressed in white. Kaalratri is also known as Shubankari meaning someone doing auspicious things. She has four arms and rides on a donkey. Her right hands are in Abhayamudra and Varadamudra and on the left hand she carries a sword and deadly iron hook. Mantra: Om Devi Kalaratryai Namah ॐ देवी कालरात्र्यै नम. Ghatasthapana marks the beginning of nine day Navratri festivity. This has to be done at the right Muhurta as per the scriptures. 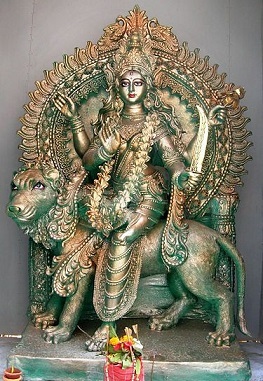 It is the invocation of Goddess Shakti, so it is prohibited during Amavasya and at night. One can find the right muhurta from a Panchang. For Ghatastapana, Kalash has to prepared first. Take a wide mouth clay pot and spread a layer of soil into the pot. Then sow Saptadhanya or seven types of grains, Barley, Sesame, Rice, Mong bean, Foxtail millet, chickpea and wheat. Add a second layer of soil and sow the 7 types of grains. Then spread a third layer of soil and the grains. Sprinkle water to set the soil and the grains. Keep five leaves of Mango tree or Ashoka Tree at the edge and put the lid. Fill the lid with rice grains. Take an unpeeled coconut and wrap it in a clean red clothe. Tie the coconut and the red cloth with a sacred thread. Place the coconut on top of the Kalash and place the Kalash on top of the already prepared grain clay pot. Light a lamp. 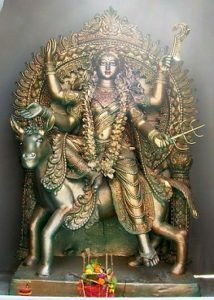 Now invoke the Goddess Shakti to reside ( awahan) in the Kalash for the nine days by praying with purity of mind and devotion. Follow it by Panchopachara Puja. Panchopachara means offering five puja items to Goddess. 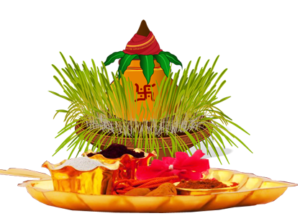 Scent, Flower, Dhoop sticks ( agarbati), and Naivedya ( fruits and sweets). Spread a red clothe near it and keep a photo or idol of Goddess Durga for praying for the nine days of the festival. Do Aarti for the Goddess. Continue the prayer and Aarti for the next nine days. Aarti is done twice a day during Puja time; mostly morning and evening. 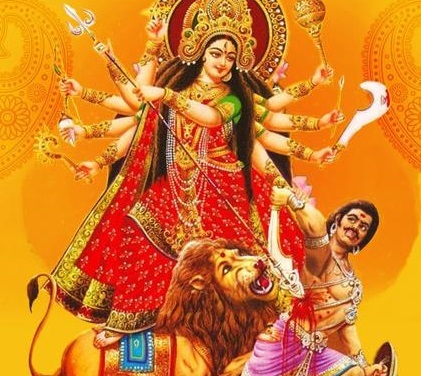 Verses from Durga Saptashati is also recited during Navratri time. Durga Saptashati is part of Markandeya Purana with around 700 verses. Each day of Navratri is dedicated to Nine avtars of Shakti and prayers and Puja for different avtars are offered depending on the day. Ie on second day Brahmacharini Puja is done. Kanya Puja can be done on eighth day or ninth day. Nine young girls representing the nine forms of Goddess Durga are worshipped. It is not necessary to invite 9 girls. it can be anything from 1 to 9 depending on your capacity. Girls from the age of two to ten are invited. Once they arrive, wash the feet of the young girls. With devotion and love feed them, as if Goddess has visited your home. Usually Halwa, Poori and Chana are prepared for them. After giving them food apply tilak on their forehead and give them gifts or clothes to make them feel happy. After the 9 days of Navratri Puja, tenth day is Navratri Visarjan. With unbroken raw rice and some flowers in hand Go to the chowki where the Kalash and Goddess photo is kept. With devotion thank the Gods for coming to your home for the Puja. Request them to accept the Puja and go back to their world and come again when you pray. Take the coconut kept on the Kalash and consider it as Prasad and share it with other members of the family. Sprinkle the sacred water around the house. Take the coins out and keep where you keep your money and rest or the items are considered as Prasad. Place photos of Gods back to Puja Room. Offer some grain sprouts to Goddess Durga. Place rest of the sprouts under Peepal tree or flow them in river or a pond. On the nine Navratri days, women from Gujarat and Maharashtra usually wear clothes of different colours. Each day got a specific colour. The first colour of the Navratri is decided based on the weekday when Navratri begins. Monday, Tuesday, Wednesday, Thursday, Friday, Saturday and Sunday will be having White, Red, Royal blue, Yellow, Green, Grey and Orange respectively. Ie if the first day of Navratri is Monday, the colour for the first day is white and second day red, third day Royal blue and so on. If the first day of Navratri is a Sunday, the colour for first day is Orange and second day is White, third day is red; and it follows the above said order. The Navratri rituals and celebrations change from regions to region. Navratri is celebrated in the most colourful way in the state of Gujarat. In Gujarat it is a festival of dances. Gujarat erupts in those nine days with joyous celebrations. Gujaratis wherever they are around the world, take their traditions with them creating the colourfulness they enjoye d in their motherland. 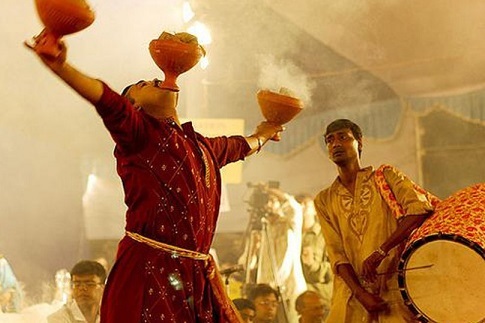 In Gujarat, each night during the festival people gather in open spaces to celebrate dancing Ras Garba. It is a dance form which originated from Krishna worship rather than Durga worship. A small Goddess shrine is erected by the community in a gathering space, the shrine includes a ‘garbo’, an earthen pot in which a betel nut, coconut and silver coin are placed. This represents a womb, which is a representation of Atman. 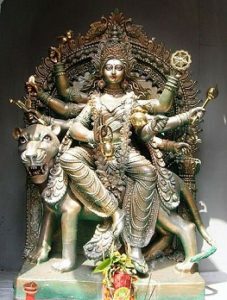 The shrine also will have the photo of Goddess Durga as an object of veneration. Each night, the local community or neighbours gathers to perform a puja to one of the nine forms of Goddess at the shrine, After the Puja the music begins and people begin to dance in circles whirling away till late night. Men and women wear colourful attractive clothes for dancing and women adore themselves with traditional jewellery. 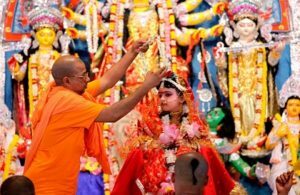 Bengalis and people of Eastern India celebrate Navratri as Durga Puja in the most spectacular way. Durga Puja is to celebrate the victory of Goddess Durga over the Demon Mahishasura. It is a ten-day festival beginning with Mahalaya, a day in which Hindus remember dead relatives. The sixth day called Shashthi, is when local community welcome the Goddess and the festive celebrations are inaugurated. Durga Puja is more of a social festival celebrated in the community with a religious touch. Temporary stages are built in community squares for large scale celebrations Festive celebrations and worship will begin at elaborately decorated spaces and invoking the Gods as guests will begin. Seventh day is Saptami, eighth is Ashtami and Ninth is Navami. Goddess Durga along with Lakshmi, Saraswati, Ganesha and Subrahmanya are revered in these days during the Puja. On Saptami, bathing of the goddess, Aarti of Gods and recitation from religious texts will take place. The rituals will continue on Ashtami, Kanya Puja is performed on Ashtami. For Kanya Puja, a young girl is worshipped as an incarnation of Durga. Sandhi Puja is performed at the moment when Maha Ashtami ends and Maha Navami begins. It is believed that the Goddess killed Mahishasura at this time. Sandhi Puja requires a grand arrangement that entails 108 lotus flowers, 108 lamps, platefuls of sweets, a large pot full of rice grains, clothes, hibiscus garlands, wood apple leaves, vermillion, etc. The surrogate effigy is smeared in red vermilion to symbolize the blood spilled in the war. The Goddess is offered food and joyous celebration of victory will begin with dancing and playfully smearing faces with Sidhoor (Red vermillion). Dhunuchi Naach is an attraction of the Durga Puja celebration on festive evenings. Dance is performed holding earthen lamps with burning coconut shell in both hands before the Goddess. On the 10th day which is Vijaya Dasami, the statues of Goddess Durga are taken to a waterbody like river or sea ,and ceremoniously immersed in water. People spend this day distributing sweets and visiting friends and relatives. Why I don’t touch the feet of my Guru?